The Friendship You'll Always Remember ... In The Film You'll Never Forget. When the irrepressible C.C. 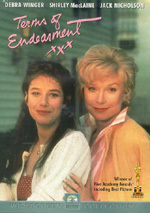 Bloom (Bette Midler) and the shy and proper Hillary Whitney (Barbara Hershey) first meet under the boardwalk at the beach, all the 11-year-olds have in common is the need for a best friend. Worlds apart in lifestyle and location, their friendship ebbs and flows through a lifetime of highs and lows, career changes, marriages, jealousy, and more. From the boardwalk in Atlantic City to the beach house on the Pacific, Beaches will remind you of what being a true friend means. $198.361 thousand on 7 screens. Back when he directed Beaches in 1988, Garry Marshall remained best known as a TV guy. After all, he was all over 1970s television as a primary factor in series like Happy Days, The Odd Couple, Mork and Mindy and Laverne and Shirley. Marshall would earn true cinematic success two years later with 1990’s megahit Pretty Woman. Beaches didn’t establish him as a big-time director but with a gross of $57 million, it was his biggest movie to that point, as none of his four prior flicks made much of a box office dent. I love The Odd Couple and remain quite fond of Pretty Woman, but I must admit Marshall’s other films haven’t done much for me; they’ve ranged from mediocre to poor. Did I have any reason to expect Beaches to change that? No, but I figured it was worth a look in the off chance I might be pleasantly surprised. We meet CC Bloom (Bette Midler), a successful singer/actor. During the soundcheck for a big concert, she receives an urgent message that forces her to flee and head from LA to San Francisco. Why? We don’t find out right away, as the film immediately goes into flashback mode and lets us see CC at 11 (Mayim Bialik). When fellow pre-teen Hillary Whitney (Marcie Leeds) gets lost on an Atlantic City beach, CC helps her and a lifelong friendship launches. They come from different worlds – CC a hard-scrabble city kid, and Hillary a coddled rich girl – but they bond quickly and start a good decade of pen pal correspondence before adult CC and Hillary (Barbara Hershey) reunite in person. We follow their paths over the years as we lead toward the big crisis that the movie’s opening foreshadows. After a fairly successful career as a singer in the 1970s, Midler made claims to “serious actress” status with 1979’s The Rose, an effort that earned her the first of two Oscar nominations. Rather than capitalize on this, Midler waited three years for her next movie role – and then went with comedy. 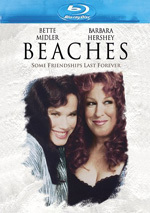 From 1982’s Jinxed to mid-1988’s Big Business, Midler only took on comedic roles, so late 1988’s Beaches provided her first dramatic turn since The Rose. Midler received her second/final (to date) Academy nod for 1992’s For the Boys, but this wasn’t for lack of trying, as Beaches smells of “Oscar bait” from start to finish. Midler served as a producer and the project feels like a vanity affair to a large degree, Midler’s attempt to transform her career and get some sweet, sweet Oscar love. In practical terms, it failed, as the movie only got one Oscar nomination in the Art Direction/Set Decoration category. (Midler’s massive hit song “Wind Beneath My Wings” wasn’t written for the movie, so it wasn’t eligible.) Midler failed to get the Academy’s recognition for her work, and I suspect there’s a good reason for this: she was pretty lousy. I probably shouldn’t single out Midler, though, as everyone/everything involved in Beaches flops. Honestly, it’s tough to find anything positive to discuss here. Midler still seems stuck in “comedy” mode, as she doesn’t transition to the film’s dramatic/emotional roles well. She’s big, brassy and bawdy, which is fine at times but doesn’t work for others. Too much of the flick smacks of “vanity production” as well. Why do we get so many musical numbers in this character drama? To show off Midler’s skills, I guess. These tunes just come out of nowhere and fail to fit the project. They’re there so Midler can impress us with her talents; they have nothing to do with the rest of the film. Perhaps to compensate for Midler’s broadness, Hershey goes in the other direction. She creates a character with a mopey, flat personality who seems to exist solely to contrast Midler. I get that the movie wants us to see two opposites who bond, but it could’ve done more to create interesting personalities. At times, Beaches feels like a parody of the Terms of Endearment style of melodrama. What made anyone think that Marshall – with a background firmly rooted in comedy – would be a good match for an emotional drama about two women? I have not the slightest clue, but he’s a poor fit and he can’t bring anything more than mawkish sentiment to the table. Mawkish sentiment that fails to pay off in any way, too. Some themes hit me harder than others, and tales about mothers who die and leave behind small kids affect me in a massive way. If a film features that conceit and fails to elicit even a hint of a tear in my eye, there’s something wrong. Beaches is that film. No matter how hard it tries to push emotional buttons, it fails miserably. I’ve wept at some crummy “dying mom” movies in my day, but Beaches is so phony that it can’t even manipulate my easily pulled heartstrings. By the way, it seems ironic that the movie was nominated for Art Direction/Set Decoration because it shows precious little awareness of the eras through which it romps. Oh, it occasionally gets clothes/props/styles correct, but too much of the time, it’s way off-base. Take the “Oh Industry” show tune, for instance. Though it’s supposed to have been done in the late 60s, the song and choreography scream “late 80s”, and that’s not an isolated incident. It’s next to impossible to tell where we are chronologically from visual elements because they almost always look like they’re from 1988. In the end, Beaches provides a failed character drama. It lacks depth, narrative clarity or true emotion. Overacted, campy and mawkish, it’s a dud. Beaches appears in an aspect ratio of approximately :1 on this Blu-Ray Disc. The film came with an erratic transfer but usually looked fine. At the start, though, I feared the worst, as the flick’s opening scenes presented horrific visuals. The early shots of CC’s Hollywood Bowl soundcheck and the flashbacks to Atlantic City show overwhelming grain, blocky resolution and muddy colors. Some of those concerns appeared the rest of the way, but the image managed to tame them for the most part. Overall definition seemed positive; some softness materialized at times, but the majority of the movie exhibited good – though not great – delineation. I saw no jaggies or shimmering, and edge haloes remained absent. With all that grain, I didn’t suspect any digital noise reduction, and print flaws failed to appear. The movie portrayed a natural palette that occasionally demonstrated good vivacity. However, these elements were erratic, which I expected; 80s movies often came with bland colors, and that was occasionally true here. Still, the hues were reasonably solid – after the aforementioned opening scenes, at least. Blacks were fairly deep and firm, and shadows looked fairly clear. Nothing here excelled and the image was hampered by the nature of late 80s film stocks, but after an ugly beginning, the movie seemed generally attractive. As for the DTS-HD MA 5.1 soundtrack of Beaches, it worked fine given the movie’s age and ambitions. While the soundfield didn’t boast a tremendous amount of ambition, it gave us a good environment for this story. A few broader scenes – such as at shows or on the beach – demonstrated nice use of the surrounds and opened up the spectrum. Music demonstrated useful stereo delineation, while the effects in the front provided a fine sense of place. Audio quality aged well. Speech was consistently natural and concise, while music seemed lively and warm. Effects came across as accurate and distinctive, and they showed decent dynamic range. At no point did this mix threaten to tax my system, but it was more than satisfactory for its age and scope. When we shift to the disc’s extras, we start with an audio commentary from director Garry Marshall. He gives us a running, screen-specific look at story and characters, cast and performances, sets and locations, music, editing and cinematography, costumes, hair and production design, and a mix of other areas. I’ve enjoyed prior Marshall commentaries, and this becomes another good one. I especially like Marshall’s focus on less obvious complications involved with productions; he doesn’t just touch on the “big ticket” items, so we learn about the little things that otherwise might never occur to us as part of the director’s domain. Marshall occasionally just narrates the movie, but I can excuse that, as he offers so much good info the rest of the way. Under Beaches Bloopers, we get a six-minute, 59-second reel. Apparently created for use back in 1988, this one offers the usual goofs and giggles, though a narrator attempts humorous commentary as well. It’s typical for its genre. With AFI’s 100 Years, 100 Songs with Bette Midler, we see a short one-minute, 17-second clip. Taken from a 2004 TV special, Midler talks a little about the tune and its use in the movie. She tells us how lucky she was to be able to sing the song and how well it works in the flick. Yawn. The movie’s hit song shows up again via its Music Video. The “Wind Beneath My Wings” video gives us a black and white piece that mixes lip-synch footage of Midler with images of little kids who play on a beach. It’s unimaginative, but at least it leaves out movie clips, so that earns it some bonus points. Finally, we find a Barbara Hershey Screen Test. It goes for six minutes, 18 seconds and shows a scene in which CC and Hillary make up with each other as well as a couple of subsequent sequences. Midler works with Hershey in the test, so that makes the reel more interesting than it otherwise might be. The disc opens with ads for The Odd Life of Timothy Green and Monsters University. These also pop up under Sneak Peeks along with clips for ABC TV series and Castle. We find the trailer for Beaches as well. Sentimental, clumsy and unmoving, Beaches feels like a cardboard cutout character drama. It lacks realism, emotion or spark as it plods along through its dull 123 minutes. The Blu-ray comes with erratic but usually positive picture, pretty good audio and a satisfying audio commentary. This is a quality release for a forgettable movie.